Master Israeli intelligence agent and art restorer Gabriel Allon, now head of Mossad, known as the Office, the country’s secret service, is on the hunt for Saladin, the elusive Isis terrorist, who made his explosive debut in the Black Widow where he left a trail of devastation in Paris, murdering Allon’s long-time friend Hannah Weinberg, who headed the Isaac Weinberg Centre for the Study of Anti-Semitism in France. In the Black Widow, Allon recruits a Jerusalem doctor, Natalie Mizrachi and turns her into his own black widow in the image of escaped terrorist, Sofia Bourihane. The mission to track and kill Saladin is partly successful and Mizrachi tended to his debilitating injuries that left him with a pronounced limp. As Natalie is the only intelligence officer that can identify Saladin, she is brought back into the field after a series of bombings rocks Washington and then London, leaving hundreds dead. The Israeli team don’t have too many clues apart from the assault rifles used in London which lead to Nouredine Zacharia, a French-Moroccan low-life criminal who works for Isis. Allon who has made many friends (and enemies) during his stellar career as a spy manages to recruit the Western intelligence agencies, including a highly specialised and top secret French unit, to his cause, and the hunt is on. Christopher Keller, an SAS operative, an assassin for the Corsican Mafia and a former IRA soldier, once an enemy of Allon’s, is now firmly on his side. The team from the Office, many of whom will be familiar to readers of the series, are back in action. Ari Shamron who appointed Allon as his successor; although not a member, Julian Isherwood, the camp art dealer who witnesses the terror attack on St Martin’s in London’s West End; Paul Rousseau’s Alfa Group; Eli Lavon, a financial analyst; Yossi Gavish; Rimone Stern; Yaakov Rossman; Dina Sarid, a walking encyclopaedia on the Palestinians; Alllon’s wife Chiara; and Mikhail Abramov, who partners with Mizrachi in an elaborate scam that cost millions in the hunt for Saladin. The Office (Allon) buys a lavish villa on France’s Cote d ‘Azure, where Mikhail poses as a Russian billionaire, Dimitri Antonov and Natalie as Sophie, in a bid to turn a Frenchman, millionaire businessman Jean-Luc Martel, a drug kingpin, and his supermodel girlfriend, Olivia Watson, the owner of a minor art gallery, into helping the agencies search for Saladin. 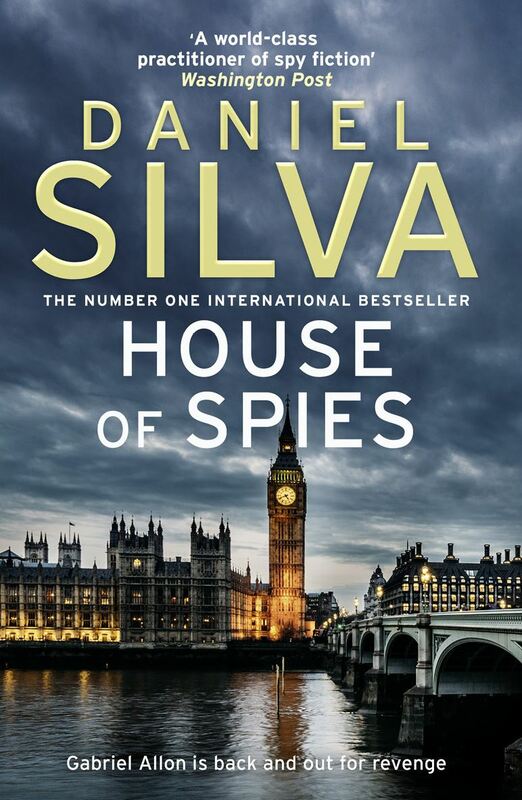 House of Spies, the 17th in the series, is an absorbing read and it doesn’t disappoint. Although to get the whole backstory and a feel for the characters you would need to read the other 16, or at least some of them.